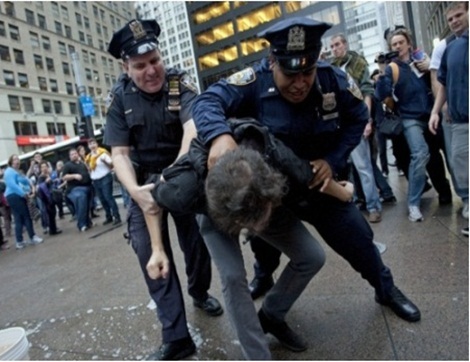 Home Editorials Judge, Jury, and Executioner: Have the Police Become a Law Unto Themselves? Living in a free society means not having to look over your shoulder to see whether the government is watching or fearing that a government agent might perpetuate violence upon you. Unfortunately, as I detail in my book A Government of Wolves: The Emerging American Police State, subjected as we are to government surveillance, body scanners, militarized police, roadside strip searches, SWAT team raids, drones, and other trappings of a police state, “we the people” do not live in a free society any longer. Now thanks to an increasingly militarized police force and police officers who shoot first and ask questions later, we’ve got one more fear to add to that growing list, and with good reason: fear of the police–local, state and federal agents. Who wouldn’t be afraid of police officers who go around shooting unarmed citizens, tasering women–young and old alike, and forcing law-abiding Americans to the ground at gunpoint? Such was the case when a Missouri police officer shot and wounded an unarmed panhandler. Texas police, during a raid on a home where music was reportedly being played too loudly, repeatedly tasered a 54-year-old grandmother, kicking and punching other members of the household. A 20-year-old Florida woman who was tasered by a police officer while she was handcuffed ended up in a permanent vegetative state and eventually died. And then there was the homeless man who was shot and killed by Albuquerque police for squatting on public land. If it were just a few “bad” cops terrorizing the citizenry, that would be one thing. But what we’re dealing with is a nationwide epidemic of court-sanctioned police violence carried out against individuals posing little or no threat of violence, who are nevertheless subjected to such excessive police force as to end up maimed or killed. For example, Ron Hillstrom was pacing in the parking lot of his apartment complex asking for help when four officers approached him, unleashed their tasers, and subdued him with electric shocks. When Hillstrom fell to the ground, another officer hit him with a flashlight. Hillstrom died soon thereafter. Danny Cantu was recently awarded $105,000 after Dallas police rushed into his backyard, threw a flash bang grenade into his window, and broke into his home without warning. Cantu was thrown to the ground and beaten with his hands tied behind his back. Denise Green is suing San Francisco police after a license plate reader misread her license plate, causing her to be pulled over by five police officers who pointed guns at her under the false belief that she was driving a stolen car. After being held at gunpoint on the ground, Green was handcuffed and her car searched before she was finally released. The toll such incidents take on adults can be life-altering, but when such police brutality is perpetrated on young people, the end result is nothing less than complete indoctrination into becoming compliant citizens of a totalitarian state. The message is clear and chilling: any deviation from what is “allowed” will be punished severely. Thus, when a 9-year-old Portland girl got into a fight at a youth club, instead of the incident being resolved by staff members and reported to her family, police showed up at her home, arrested the young girl, took her down to the station, fingerprinted her, and had her mug shot taken. Similarly, when 13-year-old Kevens Jean Baptiste failed to follow a school bus driver’s direction to keep the bus windows closed (Kevens, who suffers from asthma, opened the window after a fellow student sprayed perfume, causing him to cough and wheeze), he was handcuffed by police, removed from the bus, and while still handcuffed, had his legs swept out from under him by an officer, causing him to crash to the ground. In Missouri, a 7-year-old child was handcuffed because he was allegedly upset about being teased by his classmates. The inconsolable child, who was screaming in class because of the taunting, was taken by the school’s security officer to the principal’s office and handcuffed until his father arrived at the school. There might be some hope of reform if only this problem of police brutality were not so widespread and endemic, if the citizenry actually had some sway with their representatives, if communities actually had some say over how law enforcement agencies “police” their communities, if police unions did not have such a stranglehold over the oversight process, if the courts were more impartial and less inclined to blindly sanction the actions of the police, and if the federal government itself had not already coopted state and local police agencies in order to transform them into extensions of the military. In the absence of any credible scenarios that would hold the police accountable to abiding by the rule of law–our U.S. Constitution–and respecting the citizenry’s right to be treated with respect and dignity, the police have become a law unto themselves. Clearly, the master-servant relationship upon which American government was based has now been reversed. Government agents in general, and the police in particular, now seem to believe they are the masters and we are the servants. It’s definitely time to reestablish us, the American citizenry, as the masters of our government–even if it means showing the oppressors that we will no longer wear their chains. This growing tension, seen in Albuquerque and felt throughout the country, is a tension between those who wield power on behalf of the government–the president, Congress, the courts, the military, the militarized police, the technocrats, the faceless unelected bureaucrats who blindly obey and carry out government directives, no matter how immoral or unjust, and the corporations–and those among the populace who are finally waking up to the mounting injustices, seething corruption and endless tyrannies that are transforming our country into a police state. Where we go wrong is in painting our oppressors–whether it be the police, the courts, Congress, or the president–as absolutely evil and ourselves as powerless to resist. Hannah Arendt, a Holocaust survivor who reported on the war crimes trial of Nazi Adolf Eichmann, a senior officer who organized Hitler’s death camps, denounced Eichmann not because he was evil per se but because he was a bureaucrat who unquestioningly carried out orders that were immoral, inhumane and evil. This, Arendt concluded, was the banality of evil, the ability to engage in wrongdoing or turn a blind eye to it, without taking any responsibility for your actions or inactions. [T]here is nothing new about this kind of civil disobedience. It was evidenced sublimely in the refusal of Shadrach, Meshach and Abednego to obey the laws of Nebuchadnezzar, on the ground that a higher moral law was at stake. It was practiced superbly by the early Christians, who were willing to face hungry lions and the excruciating pain of chopping blocks rather than submit to certain unjust laws of the Roman Empire. To a degree, academic freedom is a reality today because Socrates practiced civil disobedience. In our own nation, the Boston Tea Party represented a massive act of civil disobedience.